This entry was posted on Wednesday, October 6th, 2010 at 9:32 am and is filed under Environmental Protection Agency. You can follow any responses to this entry through the RSS 2.0 feed. You can leave a response, or trackback from your own site. THE MOST IMPORTANT THING IN SITUATIONS LIKE PUBLIC HEALT , IS THE INFORMATION VIA MANY WAYS!U.S.EPA IS A VERY GOOD EFFORT TO INFORM THE CITIZENS ABOUT THE LEAD-CONTAMINATED HOMES.VIA ORGANIZATIONS LIKE “EPA” , IT IS EASY SOMEONE TO SEE , IF A COUNTRY RESPESTS ITS CITIZENS!UNFORTUNATELY IN MANY COUNTRIES ALL OVER THE WORLD , THERE IS NOT PROTECTION OR INFORMATION ABOUT THE LEAD , IN ORDER TO FACE THIS PROBLEM! Thank you very much, Ms. Reyes-Arias. The recommendation that you give us today is timeful and necessarily. 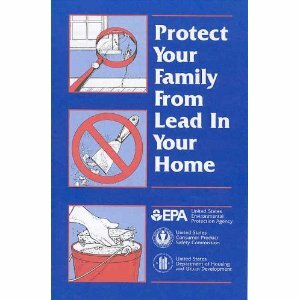 Get the publication, it will help you become aware of what lead is and how it affects your body and lifestyle. You can get rid of lead in your home if you follow the correct procedures and act quickly.